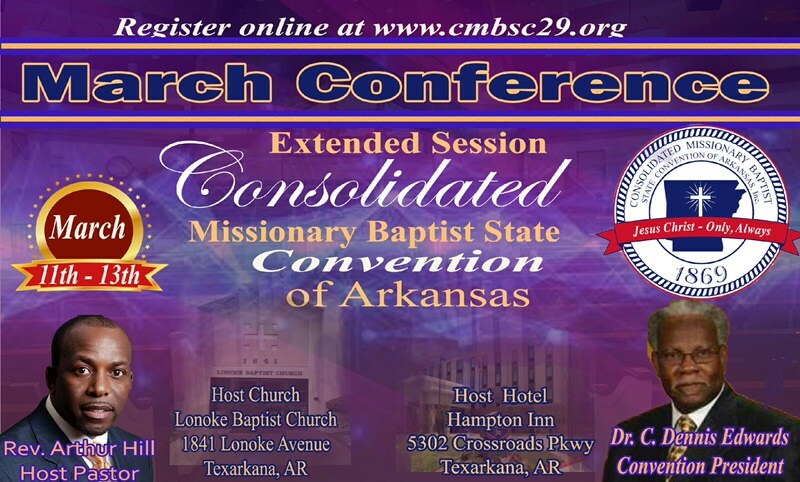 The Consolidated Missionary Baptist State Convention of Arkansas is the collaboration and association of Missionary Baptist Churches in the State of Arkansas. The Convention strives to provide an avenue for Christian Missions, Education, Evangelism, and Benevolence for the members of the various associations and churches. The Convention also provides leadership and assistance to her school, Arkansas Baptist College. Consolidated Missionary Baptist State Convention of Arkansas, Inc. Please pray for the James family. Sis. Beatrice James passed away on last night, March 22, 2019. Sis. James served faithfully as a State Convention registrar for several years. She was a member of 1st Baptist-Cordell, El Dorado, Arkansas, where Dr. Pierce Moore is Pastor. The funeral service for Sis. Beatrice James is at 11:00 a.m. on Saturday, March 30, 2019 at FBC-Cordell.